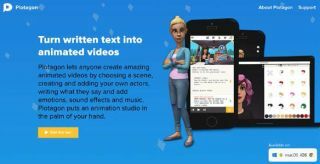 Plotagon (Web/iOS/Android) - Students choose a scene, add actors, write dialogue, and add emotions, sound effects, and music. Powtoon - Offers a library of music, text, and characters. Wideo - Students choose or upload images and animations and add audio. Zimmer Twins - Students can create a cartoon featuring the Zimmer Twins by choosing a background scene and typing in the dialogue. Dvolver - Choose from a library of characters, backgrounds, and props to create a short film. Puppet Pals and Toontastic - iOS apps for creating short videos with fun characters that students animate with voice and movement. Students can also upload their own drawings. SockPuppets - An iOS app for creating short movies with talking socks.